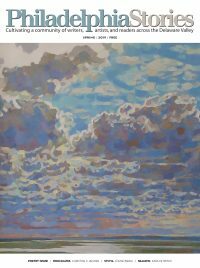 Philadelphia Stories Magazine strives to publish the finest fiction, poetry, essays and art written by authors living in, or originally from, Pennsylvania, Delaware, or New Jersey. Please follow these guidelines for submitting material. There is no reading fee. DEADLINES: Winter Theme Issue: November 1; Spring: December 15 (poetry contest issue); Summer: March 15; Fall: July 15 (fiction contest issue). PLEASE NOTE: You will be notified of the status of your submission within six months AFTER the issue deadline. If you have not heard from us within six months after your submission was sent, please feel free to contact us and we’ll check the status for you. Please note, our emails do sometimes get caught in spam filters. Thanks for submitting to Philadelphia Stories! Due to the current volume of work we have to consider, we are no longer able to accept paper submissions. Only work submitted through our Online Submission Form will be considered. All paper submissions will be recycled unread. Thank you! All submissions should be typed, 12-point font, double-spaced with a minimum 1” margin. In the top left corner of the title page please include your name, address, phone number, and email along with the word count. Please number all pages and include your name and the title in either the header or footer. Any work received after the closing date for a particular issue will be considered for the next issue. Multiple submissions are not accepted per reading period, except for poetry (up to three pieces) and artwork (up to five pieces). You may submit in more than one genre (fiction, poetry, non-fiction, art), however. Please do not re-submit previous material unless expressly asked to do so by the editor. We promise, we give everything a really thorough read and just because it may not be right for us doesn’t mean another publisher won’t love it. Please attach a SHORT bio (about 75 words, written in third person) including your connection to Pennsylvania, Delaware, or New Jersey. We will send notice by email regarding the acceptance or rejection of your material within six months after the issue’s deadline. Poetry has a rolling submission period; if your work is being held for consideration for a future issue, you will be notified. Please do not contact us regarding the status of your work before this six month period. In addition to the print issue, additional material is frequently posted on our website. You will be notified if your work is accepted online. Please send all submissions to the Fiction Editor through our Online Submission Form. We look for fiction written by Pennsylvania, Delaware, and New Jersey writers (either currently residing in, originally from, or lived here at some point) that features sharp writing, carefully crafted plots, and, above all, compelling characters. Novel excerpts should be able to stand alone as a complete work. Please submit no more than 3 poems, not to exceed 36 lines each. Up to three poems may be submitted in one submission period. If you are submitting them together, poems must be in a single file/attachment. Please indicate the titles in the title field. DO NOT try to send multiple files/attachments with this submission form. If you want to submit your poems in separate files/attachments, you need to fill out a separate submission form for each poem. Submissions will be accepted as a Word .doc, .rtf, .wpd, or .txt attachment. Do not use special characters in your filename such as: ! @ # $ % ^ */ . Please include your contact information in your file. Please send all poetry to the Poetry Editor through our Online Submission Form. Creative nonfiction essays should not exceed 2,500 words. We’re looking for pieces that focus on positive Philadelphia experiences, but will consider any well-written essay on any subject. In particular, essays should convey real emotional honesty and or humor. Please send all essays to the Nonfiction Editor through our Online Submission Form. Preliminary images do not need to be print resolution and may be attached as a JPEG or GIF. Final, approved artwork should be of professional quality, at least 300 dpi saved as a TIFF, PDF, JPEG or EPS. Do not send us links to your website. We’ll leave it to you to find your best work. Please upload all artwork to through our Online Submission Form or email to art@philadelphiastories.org.